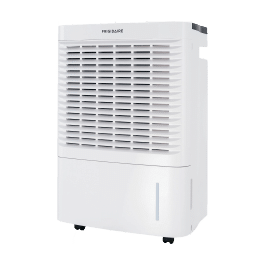 If you are looking to buy the best dehumidifier for basement, garage, or any other room of your home, with a large number of positive dehumidifier ratings, DeLonghi DD70PE Dehumidifier can be an excellent choice. I was first introduced to this amazing machine when I visited a friend who had recently bought this dehumidifier. While it might sound like an overstatement, but I literally fell in love with it from the moment I first set my eyes on this unit. Right from its sleek white built to its flawless performance, everything left me highly impressed. Needless to say, I purchased the same DeLonghi DD70PE dehumidifier when I wanted one for my home as well. 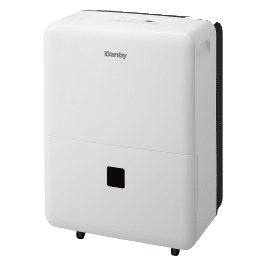 To provide you with detailed first-hand experience of this dehumidifier, I’ve created this DeLonghi DD70PE dehumidifier review. 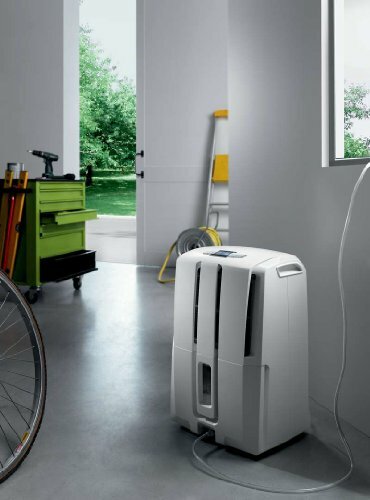 I will talk about the design, features, energy efficiency, and some of the most important aspects of this DeLonghi dehumidifier to help you make an informed buying decision. Let us begin this DeLonghi DD70PE Dehumidifier review with the design and hardware of this unit. DeLonghi DD70PE dehumidifier is one of the smartest looking dehumidifiers and has the ability to collect 70 pints of moisture in a day. The dehumidifier has a tasteful and elegant design. The grille’s on the front part of the dehumidifier are aesthetically pleasing and also help in improving the flow of air to the fan which does the job of pulling air and passing it to the coil of the dehumidifier. According to the instruction manual provided with this product the unit is ideal for 1,200 sq.feet, making it a perfect dehumidifier for basements, garages, bathrooms, kitchens, and other storage spaces. 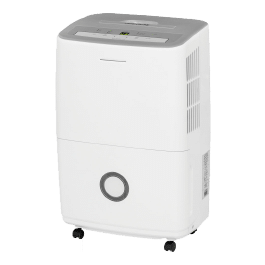 The sleek white built of the dehumidifier with LCD electric controls on the top and handles to lift the unit on the sides, the small dehumidifier will easily blend with any kind of decor. The unit weighs around 46.3 pounds and measures 15.3 x 24.3 x 12.4 inches. 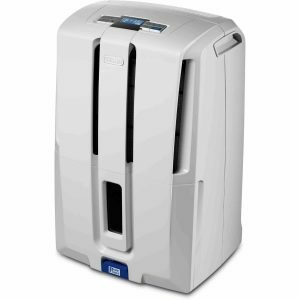 It has flexible drainage options, which we will talk about in the later parts of this DeLonghi DD70PE Dehumidifier review, and has coasters for easily moving the dehumidifier across rooms. Three Drainage Options: The dehumidifier has 3 different drainage options for complete convenience. The collected moisture can stay within the condensate bucket which you can manually remove, connect the included hose to the front of the unit for automatic disposal, or use its built-in pump to remove the water with the help of the hose over a vertical lift. You can choose any of the three drainage options as per your convenience. LCD Panel: The DeLonghi 70-pint dehumidifier features bright and easy-to-read LCD panel along with the electronic controls to adjust the different settings of the dehumidifier. On the display panel, you can easily see the current relative humidity and other settings. With the help of its soft-touch control buttons, you can easily switch between different modes, change the fan speed, adjust the timer and make changes to the humidistat. Two Custom Operating Modes: This crawl space dehumidifier has two different custom operating modes- Dehumidify mode and Continuous mode. In the dehumidify mode, the units compressor works to maintain the required humidity level and turns off the unit when the required humidity level is reached to save energy. In the continuous mode, the dehumidifier’s fan functions at maximum speed. This setting is recommended when you need to reduce the moisture from air within a short span of time. Automatic Defrost: The DeLonghi humidifier also has an automatic defrost mode which starts working when the frost gets collected on the coil of the dehumidifier. This feature comes in very hand if you are using this dehumidifier in very cold areas. 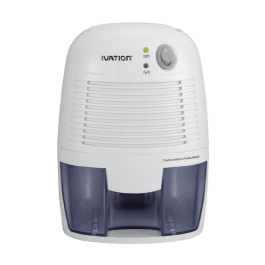 Removable Filter: Apart from removing moisture, this dehumidifier for sale also does an excellent job of purifying the air. For this, it has a separate filter which you can remove, wash and install it again to eliminate the need to buy additional filters. Next in this DeLonghi DD70PE dehumidifier review we’ll talk about the drainage system of this dehumidifier in detail. As mentioned above, this crawl space dehumidifier provides you with three different drainage options. It has a 12.7 pint built-in tank which you can use for collecting the moisture. However, you’ll be required to manually empty the tank time and again. For convenience, there is a water level indicator on the front part of the unit. The second method is to connect the included hose to this DeLonghi dehumidifier for automatic disposal of water. This feature is very useful if you are looking to place this dehumidifier in the basement. Simply connect the hose, and leave in the floor drain and the water will automatically dispose through the drain. However, if there is no floor drain in your basement, then you can use the condensate pump for eliminating the water. The condensate pump pulls the water in an upward direction allowing you to leave the hose out of a window or a sink which is located above the ground surface. No matter where you want to place this unit, depending on your requirement, you can choose any one of the three drainage options. Let us have a look at some of the beneficial advantages of this best dehumidifier for basement. My goal with this DeLonghi DD70PE dehumidifier review is to provide you with an accurate picture of this dehumidifier. Thus, I’ll also mention some of the things that are not too impressive in this dehumidifier for sale. The DeLonghi 70 pint DD70PE dehumidifier is super-easy to use and can be easily used by a person who is using it for the first time. It has a bright LCD display panel, which you can find in a lot of other dehumidifiers as well. But the display panel of this DeLonghi dehumidifier features backlight as well, making it extremely convenient to read even in low-lighting conditions. Even the touch-controls are highly responsive and the limited number of buttons, further adds up to your convenience. If we talk about its portability, it has built-in handles on the sides if you want to lift the unit or you can simply use its caster wheels to shift it to another room. The casters are made from high-quality materials and you can easily move it on tiles and carpets without any hassles. The small dehumidifier has three different drainage options for easy disposal of the collected moisture. Its condensate tank can be easily removed without any hassles if you want to manually dispose the water. Also, its filter can only be removed after removing the tank first, which is common in many of the other dehumidifiers as well. All in all, this DeLonghi DD70PE is a highly user-friendly product and a perfect pick for every home. DeLonghi DD70PE is Energy Star certified which guarantees that it is energy efficient. It only requires 680 watts of power, making it one of the most energy efficient 70-pint dehumidifier. This means that the dehumidifier is not just an excellent performer, but will also provide you with great energy savings. The DeLonghi Dehumidifier comes with a standard 1-year warranty and 4-year warranty on its sealed system. Moreover, many dehumidifier reviews also suggest that the customer support offered by DeLonghi is pretty impressive as well. If you are searching for a dehumidifier which performs flawlessly, has pleasing aesthetics, and is easy-to-use, then there is no denying the fact that this DeLonghi DD70PE dehumidifier will perfectly suit your requirement. I myself have been using this unit for more than 6 months now and the unit has never ever failed me a single time. It does a great job of eliminating the moisture from air and its advanced features only add up to its functionality. With an impressive 70-pint capacity, this small dehumidifier will be a perfect addition to any home. I hope that this DeLonghi DD70PE dehumidifier review provided you with detailed information about this dehumidifier and now you know what you need to select for your home. But if you still have any more questions about this unit, feel free to use the comments section and I will try to resolve your query as soon as possible. Q: I am looking for a dehumidifier for my 1,100 sq.feet garage, will this be dehumidifier be able to cover the area? A: The dehumidifier is rated for areas as large as 1,200sq.feet. So, yes it will be ideal for your garage. 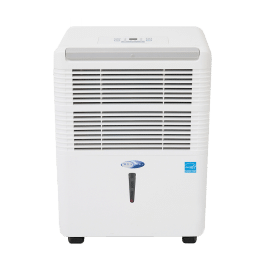 Moreover, some of the users have mentioned that they have been using this dehumidifier in larger areas, like 1,300-1,400sq.feet and the dehumidifier is doing a great job for them. Q: Is this dehumidifier loud? A: While some reviews do suggest that it is loud, I personally found it to be very quiet. Its maximum noise is rated at 53 decibels and apart from the normal buzzing sound you’ll not hear anything else. Q: Can there be a problem of its built-in tank overloading with the collected water? A: No, the dehumidifier automatically turns itself off when the condensate tank is full. Moreover, there is also a water level indicator which allows you to know the exact level of water in the tank. Q: Does the dehumidifier have an extendable handle at the top, like many other dehumidifiers? A: No, there is no extendable handle at the top. But there are built-in handles on both the sides of the unit for lifting it. Also, it has casters for moving it around. I’m curious to find out what blog system you’re utilizing? I’m having some small security problems with my latest site and I’d like to find something more safeguarded. Do you have any solutions? Please Contact our Support team to know more details to meet all your queries.